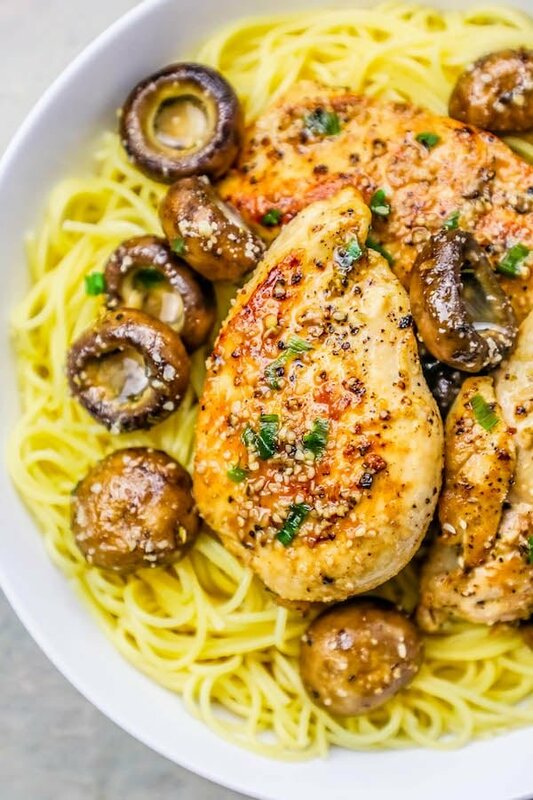 Easy delicious 20 Minute Garlic Butter Chicken and Mushroom Pasta is a family favorite bursting with garlic butter flavor in a craveable pasta the whole family will love! Thick and delicious garlic butter sauce for an indulgent and unforgettable chicken and garlic pasta! I love big, piping hot bowls of rich, indulgent, and comforting pasta – especially if they are bursting with garlic and butter flavors. 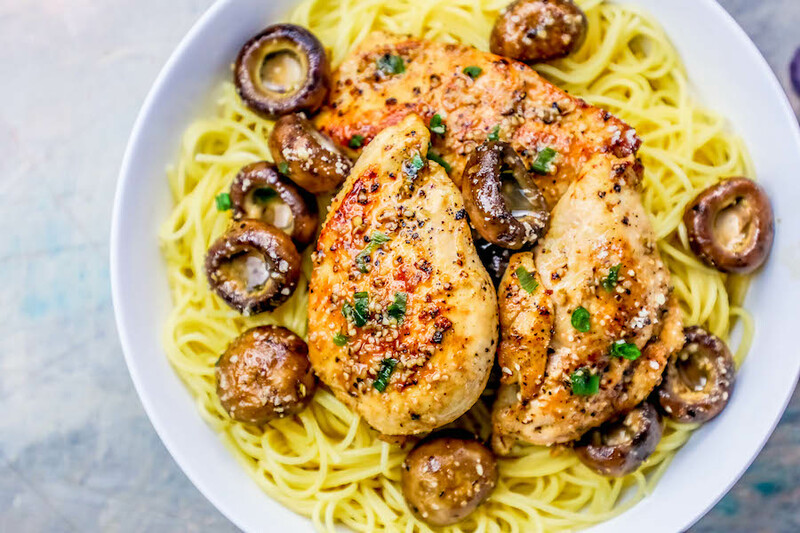 When I’m craving something quick and indulgent, I usually just toss some pasta in a garlic butter sauce – but when I’m really, really hungry, I like to add some perfect pan fried chicken breasts and mushrooms to the dish. It’s easy, simple, and quick – but tastes like a rich, indulgent and extravagant dish! 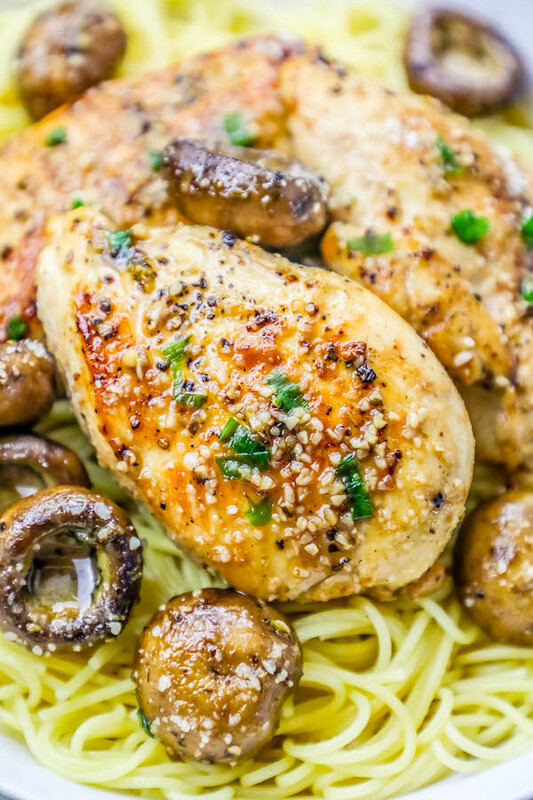 This garlic butter chicken pasta is simple and easy – perfect for a busy weeknight – but also full of flavor and special enough to be for a dinner party, served family style! It’s also a really adaptable pasta dish – you can add asparagus, peppers, eggplant, green beans, peas, or carrots if you don’t like mushrooms. -Don’t crowd the pan. Chicken needs room in the pan to brown and create a lovely, crispy crunch on the outside. -Don’t burn your garlic or undercook it! Garlic, when soft and fragrant, is a wonderful thing… but think of it more as a very gentile browning session – don’t let your garlic get too hot, or it will be bitter. -Be sure to scrape up the bits! When adding the wine and stock, be sure to scrape up any lovely browned chicken or mushroom bits from the pan. Those lend the best flavor! If you love this recipe as much as I do, please write a five star review, and be sure to help me share on facebook and pinterest! 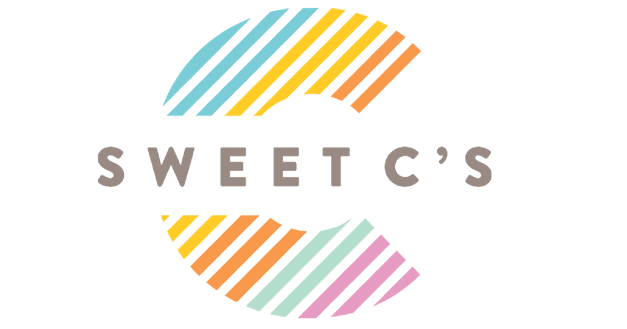 Or you can sign up for my totally free email newsletter to get my favorite easy meals delivered straight to your inbox, daily! Boil water in tall stockpot. While boiling water, add olive oil to pan and heat on medium high until shimmery. Generously salt and pepper chicken. Add chicken to pan, cook until deep brown on each side, about 5 minutes per side. Add mushrooms and cook until lightly browned and softened. Add garlic and butter, stir. Let butter melt and garlic become soft and fragrant, about 3 minutes. When garlic is lightly browned (and does not smell bitter), add chicken stock, wine, and Italian spices. Let sauce reduce and thicken, another 5 minutes. When pasta is al dente and chicken's internal temperature has reached 165 degrees, drain well and place in large serving bowl. Add chicken and sauce over the top of pasta. Toss to coat pasta in sauce. Serve, garnish with fresh grated parmesan if desired. 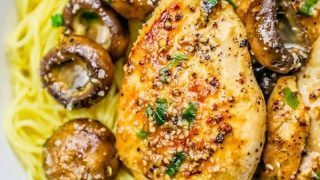 I want to make this, but I want to make sure that I am reading it correctly.. is it 1/3 or 1/4 cup of minced garlic and when do you add the mushrooms? I didn’t see mushroom on the ingredient list or in the directions and I wasn’t sure if the minced garlic was suppose to be cup. Thank you for your help.